Our Large Renaissance Skirt Hike is made with extra large rings to accommodate the thicker fabric used in many Renaissance gowns and wench skirts! Skirt Hikes are used to keep your skirt out of the mud and are easy to use! Cinch the fabric into the rings and tighten to the desired length. You can use two skirt hikes in front for a too long skirt, or use one to show off a colorful petticoat or even (gasp!) an ankle. This quality leather product is hand made right here at our leather shop in the USA, by experienced professional leather craftsmen. 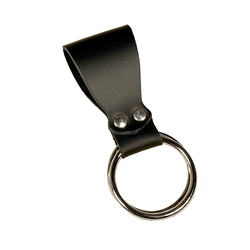 All our leather items are made from full and or top grain, premium quality cow leather bought in the USA. Our leather products, if cared for properly, will last you for years! Pretty nice quality- the ring is definitely larger than most hikes. It's probably worth noting that these are sold singly, and not in pairs. Don't do what I did and only order 1!